Many trucking companies want to operate as brokers which will allow them to go directly to shippers for loads that they want to broker out to others. This is a smart move. If two companies are operating as one, there needs to be a segregation of income and expenses and the common expenses would need to be allocated in a manner that is equitable. Plus, a consolidated balance sheet would need to be maintained as well. It is much easier, in my opinion, to set up a separte company from the trucking company for those desiring to set up a brokerage. 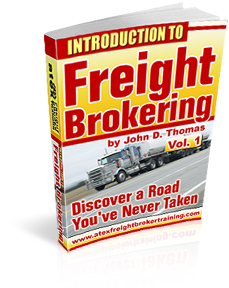 There is more to freight brokering than what many think. There are the "back room" issues such as accounting, invoicing, payables, etc. For some individuals, this is no problem; for others, it's a new ballgame and they are at mercy to others. Question: do you know the difference between the Chart of Accounts and Item Lists that you find in accounting software? You don't have to use accounting software, but it sure makes better sense. Either you or your accountant will have to come up with a Chart of Accounts and the Item List that you intend to employ. You may be able to find online resources that will help with these; but in our training, we go over these issues in broad strokes and in some fashion of detail. It builds a great framework for those who are strangers to these issues. If you are invoicing your customers, you will need to indicate in detail what items you are charging them for. For example, your main item will be the fee for moving the load. The shipper will normally be paying you in one of three or four different ways. They could be paying you a flat fee, or so much per mile, or by the piece or by the hundred weight. The charges you are invoicing them for need to be clearly set out so there is no confusion. The flat rate is straight forward. With the per mile, piece rate or hundred weight, you will include the rate plus the quantity. For example, 1,200 miles at $1.85 per mile. Or 985 pieces at $5.50 per piece. Then, there may be other charges to the customer. If they are reimbursing you for unloading fees, or if they are paying a fuel surcharge, you will indicate these separately on the invoice. An accounting program like QuickBooks will simplify all this; but there is some set up first before you can actually start invoicing your customers. Don't overlook the importance of creating simple, accurate and readable invoices. This is just one example of what to expect in our training. Do You Know What a "Chart of Accounts" Is? Most freight brokers understand that they will have to get involved to some extent with the bookkeeping and accounting requirements of their business. The first place to start is a Chart of Accounts. This Chart is a listing of all the potential accounting transactions that a freight broker might be dealing with. The Chart starts with the Assets like Cash in Bank, Accts Receivable, and then it goes into the liabilities like Accts Payable, and then on into the Income and Expense accounts like Revenue from Shippers, Reimbursement for Unloading Fees, and for Expenses, Loading Board Fees, Telephone Expense, Office Supplies, and so on. When I was providing accounting services many years ago, I created a Chart of Accounts for each client and each account had a number. The 100s were the Assets, the 200s were the Liabilities, the 300s were the Income accounts, the 400s were the Cost of Sales and the 500s were the Expenses. So at the end of each month, the client would bring in their check register and they would have each check coded based upon the Chart of Accounts. For example, Telephone expense was coded 520, Office Supplies, 511 and so on. The income would be coded like Revenue from Shippers, 301, payments to the truck would be 401 and so on. What you are doing is assigning a code number to each and every transaction that you incur. From there, the accountant can plug these into the accounting software and generate your financial statements. And, yes, a good accountant should review your codings to see if maybe their should be some revisions. For example, a loan payment would be made with one check, but the payment may include a payment on a liability AND the interest portion. The accountant can help you with some of the more complicated transactions. I hope this is helpful. Let me know if you have comments. As I've said in the past, knowing how to record, report, analyze and monitor financial activity can make or break your freight broker business no matter how well you know "freight brokering". As is true with any other business, you need to have a good grasp on the business and financial issues that impact your freight broker business.